It is said that the psychological challenge makes up 90% of the struggle in achieving consistent success as a Forex trader. Can this really be true? Yes and no. Many great traders that have written about their experiences have talked about how their own inner psychological struggles have caused them losses, even when they “knew” that whatever it was they were doing was wrong. There can be no doubt that psychological factors are of huge importance in the game of trading Forex or speculating in anything. Mastering your trading psychology won’t make you money in itself, but if you are not aware of the tricks your own mind is trying to play on itself, you will probably find yourself losing even if you are a good trader and are basically right in your trading decisions. There are a hundred ways that a trader can quietly sabotage him or herself. There is a “physical” aspect to trading. Hopefully it will help you in your trading journey to be aware of several tricks traders often get themselves caught up in psychologically. Sometimes you just have to experience something yourself in order to learn from it: nothing teaches like direct experience. Hopefully some of these points will either give you a new understanding of trading mistakes you have already made, or will warn you in advance of mistakes you have not yet made. Try not to blame yourself when you make a trading mistake: get your “revenge” instead by learning your lesson and not making that mistake again. It is surprising how many people trade without being convinced they can make money, or at least sure that they have a good chance of it. Even if you think you do believe in what you are doing, are you sure you don’t have big doubts hiding just beneath the surface? The answer to this problem is to test your methodology. For example, if you follow trends, take the time to back test on a lot of historical data. Does it show good results most of the time? Is it based on a solid concept, like mean reversion, or momentum? If the answer to these questions is yes, you should believe in what you are doing and don’t forget that you believe in it either. This one sounds very obvious. It is not just about making a plan, it is about having several plans and leaving some flexibility there too. For example, if you are day trading, you should have a method you use to decide each day which currency pair or pairs you are going to trade. However if the pair you select goes nowhere, while another pair takes off, you might want to be able to reconsider your decision instead of just “sticking to the plan”, say by allowing yourself the option to change your mind every 1 hour. This is a “plan”, but a plan can include some structured flexibility too. It is quite easy to make a plan that works on paper, but it can be something different entirely to live that plan in real time. A good example is making a plan to take hundreds of trades over a year or so, and expect your account to be in a drawdown of -20% as you go through a run of 20 consecutive losing trades. You might work through this back test in a day or so and decide such losses are acceptable. You are likely to feel very different when you spend weeks or even months losing real money again and again while watching your account balance shrink. There is no good answer to this dilemma, you just have to be aware that running through months of time in an hour or so is not necessarily good practice psychologically for bad trading times. These are the opposite sides of the same problem. 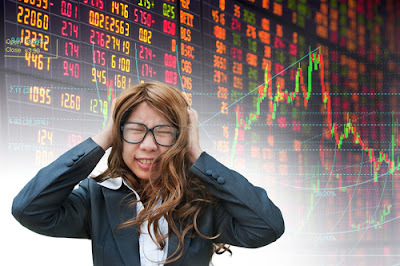 The best way to overcome this is to tell yourself every day that you are prepared to take either several trades or no trades at all, and that what you do will depend entirely upon the condition of the market instead of the condition of your wallet or your mood. There will be days with no action and days with plenty of action. You have to adapt to the circumstances. Telling yourself that if the price goes up another 10 pips you will get out of the trade, or if doesn’t go up in the next hour you will exit the trade. This is just your mind running with its anxiety and talking nonsense. Ignore it, hold firm, and only exit trades according to your plan. You see a profit on the table and think how nice it would be to just take it and stop trading for the day and bask in the glow of a profitable trading day. This is laziness and self-indulgence and has to be fought. The only reason for taking a profit should be because you have a real reason to believe it is probably not going to go much further in the desired direction. Let that market demonstrate that to you: don’t anticipate. This is really the same as itching to take a profit. It might be that you need to reconsider your risk management strategy. There is a simple way to avoid this: always use a hard stop loss and do not ever widen it. It is so easy to make excuses. If I hadn’t missed the bus / been distracted / been in a bad mood then I would have handled that trade better and made money instead of losing. It is your job to make sure that you don’t miss the bus or get distracted or fall into a bad mood. Once you take responsibility for all your trading, your mood can lift as you see there is a way for you to make things better. It is a marathon journey, not a sprint. You do some testing and devise a strategy that makes 20% per year on average. But wait! You try something else and find it makes even more, say 25%. Is there something better out there? Maybe, but this searching and testing process can take a long time. Consider this: if you spend 6 months testing instead of trading in a committed way to find a way to make 25% instead of 20%, you just lost 10% and it will take you another year to make it up! By all means continue searching, but don’t let it affect your trading. As long as you have a fairly solid methodology, it doesn’t have to be perfect! Which One Should You Use, MT4 or MT5 ? How Trend Following Strategy Can Be So Popular?